MindTrap and MindTrap II: Games that will challenge the way you think! MindTrap is a boxed game that contains over 500 puzzles, each on a card with the puzzle on one side, and the answer on the other side. A game board (of sorts) is provided to track the progress of the players or teams involved in the game, and the first player or team to land on the last square on the diagram/board wins. There are 2 routes that can be taken on the board, and one route is almost twice as long as the other. The players or teams get to choose which route to take, and should of course base this decision on whether they want to play a short or long game. Although no rules for solitaire play are provided, it is possible to play a solitaire game by setting rules similar to the following: You win if you answer 10 puzzles correctly, and lose if you miss 10 puzzles. Whichever event occurs first determines whether or not you win. You may also want to create solitaire rules that utilize the game die. My friends and I generally agree that the quality of the puzzles in this game are high, although we have come across a few that were felt to be somewhat weak. There are enough puzzle cards to provide several game sessions without coming across the same card twice, which is of course a plus. I strongly suggest this game for people (like myself) who enjoy puzzles, brain teasers, and board and dice games. Despite a few weak puzzles, the game has proven to be quite a bit of fun. 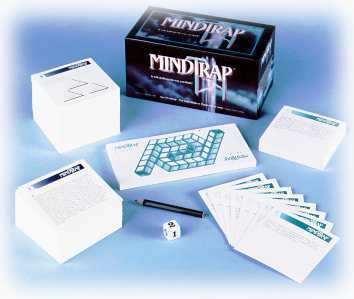 MindTrap is suggested for ages 12 and up, and for individuals or teams of 2 or more. You can find MindTrap and MindTrap II online for purchase here.